Jonathan Cornue, a former high school English teacher and integration specialist for a technical high school, is a staff and curriculum development specialist for the Madison-Oneida Board of Cooperative Educational Services (MO BOCES). He creates and presents workshops on many topics, including brain-based learning and rubric development. Jonathan coaches incoming teachers and their mentors, facilitates test development, assists in planning changes to curricula in all grades and subject areas, writes and oversees grants, trains presenters, helps administrators refine teacher support systems, and interprets state regulations for area districts. He has served on the board of the National Abolition Hall of Fame and Museum and as a member of the New York State Amistad Commission and the New York Statewide Professional Development Group. He has worked with school districts throughout New York state and presented his thoughts on grading changes at the 2015 ASCD annual conference in Houston. Jonathan, a graduate of Elmira College, earned a master’s degree in education from the State University of New York at Cortland. 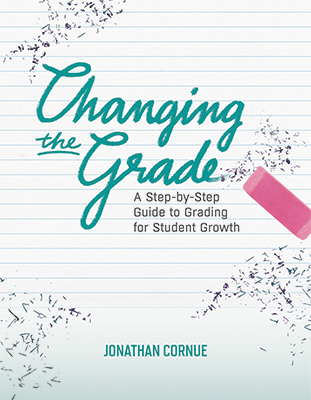 Changing the Grade presents a detailed model for developing a more reliable, standards-based grading system and includes 30 steps to guide teachers through the process.